Getting a good night's rest can be difficult—especially if you have sleep apnea. This common sleep disorder affects an estimated 22 million Americans, with the vast majority unaware that they have it. 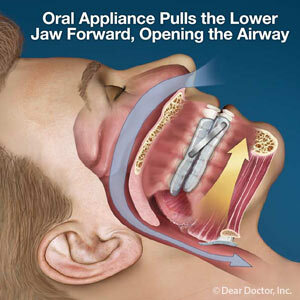 Dr. Janette Williams is a dentist in Montgomery, OH, who is certified in treating sleep apnea with special mouthguards. Interested in learning how your dentist can help you sleep better? Read on! It's natural for your muscles to relax while you're sleeping. However, when you have sleep apnea, the muscles in the back of your throat (known as the soft palate) become too relaxed and actually close off your airway. This lack of oxygen sends a signal to your brain to wake up and resume normal breathing. You may not remember these instances, especially if they happen hundreds of times throughout the night, but you'll likely feel groggy and unfocused the next day as a result. The constant oxygen deprivation is also thought to play a part in other health issues such as irregular heart rhythm, stroke, and high blood pressure. How can my dentist treat my sleep apnea? If you've been diagnosed with sleep apnea, you may not be enthusiastic about the prospect of a CPAP machine, which requires you to wear a large mask connected to a noisy machine during sleep. For people with mild to moderate sleep apnea, specially trained dentists like Dr. Williams in Montgomery, OH, can help manage symptoms with a custom-made dental appliance. Worn inside the mouth during sleep, these devices help reposition the jaw or tongue to make more room for the relaxed muscles and allow the airway to remain open. To learn more about sleep dentistry, or any other dental-related treatments and procedures, contact Montgomery Dental Care today to schedule a consultation with Dr. Janette Williams! Our number is (513) 793-5703. Over 20 million Americans suffer from some form of sleep apnea, according to the American Sleep Apnea Association. But many people living this common sleep disorder (as many as 80% by many estimates) are not aware that they suffer from the condition. There are several types of sleep apnea, and although many people live with the disorder for years, sleep apnea can lead to potentially serious health risks and complications if left untreated. Dr. Janette Williams, a dentist in Montgomery, OH, offers treatment options for patients suffering from sleep apnea. People with sleep apnea stop breathing for seconds at a time throughout the night, which disrupts the sleep pattern and causes a range of symptoms, the most common of which is chronic snoring. There are three main forms of sleep apnea"
Obstructive is the most common form and results when the muscles in your throat relax while you sleep and temporarily block your airway. Central sleep apnea is rarer and is caused when there is a problem with the signals between the brain and the throat muscles that control breathing during sleep. Complex sleep apnea is a combination of both obstructive and central. If you have been diagnosed with sleep apnea, dentists can help manage your sleep apnea symptoms by prescribing oral appliances that help to keep your airway open while you sleep. The most common treatment is Continuous Positive Airway Pressure (CPAP), if you can't tolerate the CPAP machine your dentist can offer oral appliance treatment. For more information on how to manage your sleep apnea symptoms, contact Montgomery Dental Care by calling 513-793-5703 to schedule an appointment with Dr. Williams today.